With the variety of social media platforms available, it can become overwhelming to ensure your brand stays consistent on each platform. One of the biggest symptoms of brand inconsistency is a disengaged audience. Brand inconsistency sends disconnected messages to your audience about who you are - acting as a wall and deterring your audience from engaging with you. In worst-case scenarios, brand inconsistency can even destroy credibility and perceived quality of product. In order to avoid these issues, here are three easy tips you can start implementing immediately to maintain brand consistency across all of your social media. There are over 1 million words in the English language and over 1 million ways you can mix and match these words to align with the ‘tone’ of your brand. For example, if you’re a consumer-facing brand, your tone might be more upbeat and friendly. If you’re a B2B brand, perhaps your tone is more serious and informative. Whatever the case, getting clear on this will allow you to more easily use words that align appropriately with the ‘tone’ or ‘voice’ of your brand. So whether you’re communicating through a blog post, tweet, or Facebook post, it will be consistent across platforms. Whether you’re sharing a photo on Facebook, Twitter, or Instagram-- the concept remains. Lighting, filters, and even the subject should be uniquely yours, and should be used every time you share a photo. Choose a filter or a frame that expresses your brand personality, and use that exact filter every single time you share a photo. Your audience will start to recognize these subtleties over time, and while it may seem small, the payoff is HUGE as these efforts will lead to an elevated brand and brand recognition. You do not need to put your logo on every photo that you share. That is overwhelming for people and also unnecessary. You should however, place your logo on custom designed graphics or posts that encapsulate your brand in one statement. Perhaps you’re sharing a quote, or a behind-the-scenes picture. Whatever it is, remember that an image that drives home what your brand is about should contain your logo. This is a powerful way to educate your audience on what your brand stands for. Taking the time to implement a consistent voice and strategy should be top priority for fresh produce marketers who want to expand their reach and engagement with consumers. When you can internally become clear on the points listed above, you’re ultimately creating a better experience for your audience, encouraging more opportunity to engage and connect. This reflects positively on the perceived quality of your product, and elevates your brand and credibility over time. 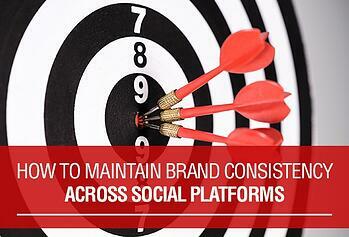 For more tips on social media that can help you to achieve consistency, take a look at our free social media toolkit.